William Hill, the UK’s favourite bookmaker offers a easy to use and great looking casino. There is a very good balance of games with rare tables games such as Blackjack switch to 100 line slots all with a high and consistent level of quality and if you prefer to stick with real dealers William Hill now also features live dealers for certain games. 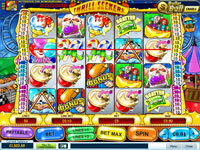 There are many promotions on offer including a 150% cash match bonus for new players. William Hill offers a decent 150% cash match bonus up to £150, the bonus is subject to 33x bonus wagering requirements (worded as 20x deposit + bonus). William Hill also have a 2nd deposit bonus, matching it by 60% (up to £500) i.e. deposit £100 get a £60 bonus, this is subject to 40x wagering requirements (worded as 15x deposit + bonus). For subsequent months when your account is at zero, William Hill will top up each deposit by 20% up to £100 (i.e. deposit £250 get £50 bonus). This comes with wagering requirements of 15x deposit + bonus which works out to a hefty £4.5k wagering requirement for a £50 bonus (90x bonus!). This is awared automatically so you have to contact customer services to opt out if you do not want it. 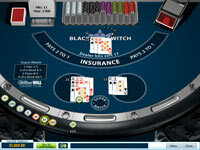 William Hill now features Blackjack switch, a variant which you play with 2 hands and are allowed to swap the starting cards between the hands to optimise your odds. The slots games such as Chinese kitchen are well designed and generally a cut above the clones in Microgaming casinos and recently have licensed the rights to make film/comic themed slots such as Incredible Hulk and Iron Man. William Hill accepts every payment method worth caring about and processes payments quickly. They also give a small bonus up to 15% just for depositing (usually 10% for traditional methods such as credit/debit card and 15% for the e-wallet methods). These however come with hefty 15x bonus + deposit wagering requirements. William Hill offers support via all the usual means such as online chat, email and freephone. The call centre is UK based and we cannot fault the customer services. Every question we asked was answered by a very knowledgeable rep.